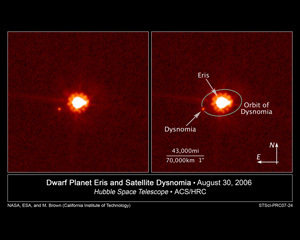 The dwarf planet Eris and it’s moon, Dysnomia. Eris is a dwarf planet and plutoid that is located beyond the Kuiper Belt, specifically in the region known as the scattered disk. The planet was named after the Greek goddess of strife and discord. This is a particularly fitting name because the discovery of Eris caused a great amount of debate amongst astronomers as to whether Eris should be known as the tenth planet in our solar system (when Pluto was still classed as a planet). Initial observations showed Eris to be 27% larger than Pluto, although more recent calculations show that the planet may actually be slightly smaller than Pluto. It was the large size of Eris that led to the discussion at the International Astronomical Union about what should be called a planet and what should not. Eris has one known moon in orbit. 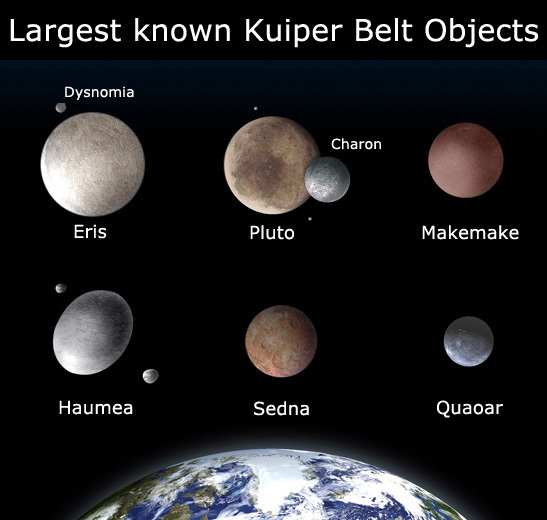 Find out more facts about the dwarf planet Eris. Eris is found beyond the Kuiper Belt in a region called the scattered disk and it takes 557 Earth years to complete an orbit of our Sun. 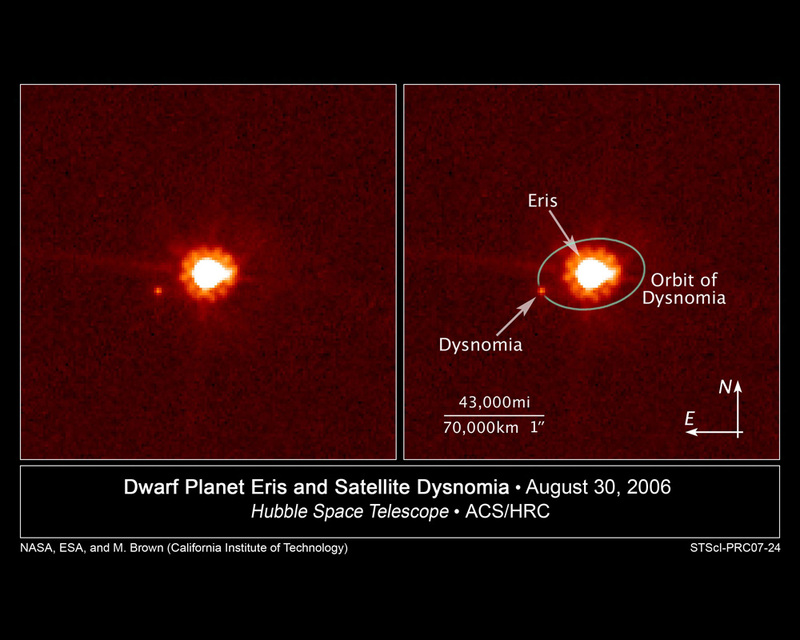 Eris has one moon in orbit called Dysnomia which takes 16 days to complete a full orbit of Eris. Dysnomia was the daughter of Eris in Greek mythology. The orbit of Eris takes it far outside the plane of the orbit of all the other planets in our solar system. The surface temperature of Eris is thought to be between the ranges of -217 degrees Celsius to -243 degrees Celsius. Eris is so far from our Sun that its atmosphere sometimes freezes due to lack of sunlight! The atmosphere is then seen to gleam and reflects as much light as freshly fallen snow. Over the course of hundreds of years and when Eris gets closer to the Sun, the atmosphere then thaws. Scientists believe that the surface of Eris is rocky – similar to the surface of Pluto. Before the dwarf planet was officially named, it was called Xena (after the TV show) by the astronomers that discovered it.